Having diarrhea is bad enough, but when it’s at night and interferes with your sleep, that’s even worse. The discomfort and sleep interruptions combined with concerns about an embarrassing accident make nighttime diarrhea one of the most unpleasant sleep disrupters you could ever experience. Thankfully, most cases are temporary and last only a night or two at the most. However, chronic or frequent instances could be the sign of an underlying problem, such as bowel disorders, infections or diabetes. 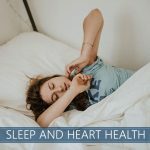 In this article, we’ll discuss what causes nighttime diarrhea and what you can do to help prevent it from happening in the future. 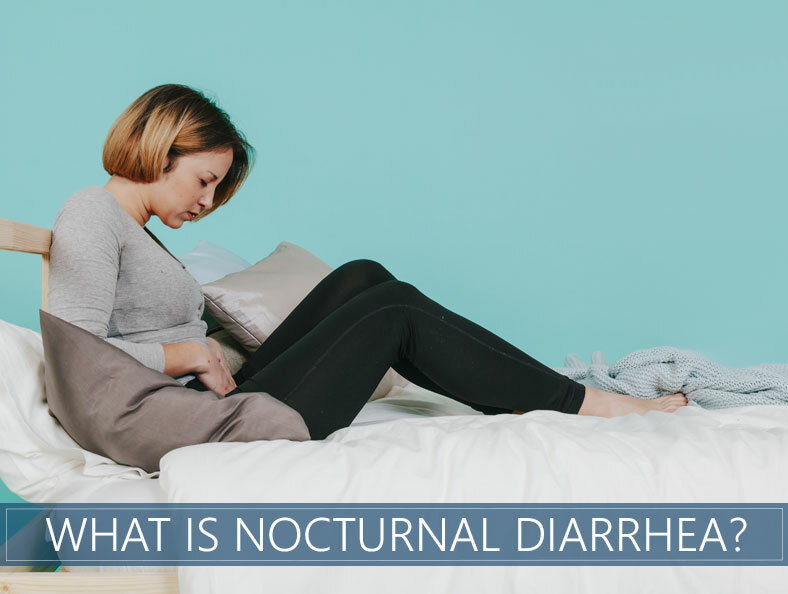 As the name suggests, nocturnal diarrhea is loose and watery bowel movements that happen repeatedly and almost uncontrollably at night. Nighttime diarrhea has happened to even the best of us at one time or another. It’s usually not dangerous unless it continues for weeks at a time. Often, if you retrace your steps and play back what you did and ate during the day, you may be able to find the cause. Once you know the reason, you can take steps to prevent future bouts of this condition at night. Instead of a solid or log-like formation, you may experience stools that are thinner and even watery. Often, pain in the abdominal area will accompany this condition. There are approximately 21 potential causes of this pain or cramping, including food or drug allergies, PMS, and infections like E. coli. The need to go can be intense and come without warning. Sometimes, your stomach will settle down, and you’ll feel like everything is back to normal. And then, without warning, you’re sprinting to the toilet. If you’re experiencing nocturnal diarrhea, try sleeping as close to the bathroom as possible! Our digestive system connects organs and pathways from our colon all the way up to our mouth. You’ve probably heard the phrase, “coming out of both ends.” Well, if you have diarrhea, you may experience nausea along with it. It could a gas build-up or a symptom of gastroenteritis or IBS (irritable bowel syndrome). Regardless, it’ll be an unpleasant feeling. What causes this bloating to happen, anyway? The most likely answer is whatever is invading your digestive tract, whether it’s a parasite, bacteria or virus, is going through its own lifecycle, and gas is a byproduct. Fever is a sign of infection. It could be bacterial or viral. So, if you have the flu, for example, you may have diarrhea and fever to go along with it. An infection is the most common cause. It could be viral, bacterial or parasitic. These germs can lead to a gastrointestinal infection, and diarrhea is the body’s natural way of flushing them out. If you read the package insert of your medications, you may be alarmed by the list of side effects. Some of them are worse than the actual disease or ailment itself! One common side effect of many prescription medications is either diarrhea or constipation. 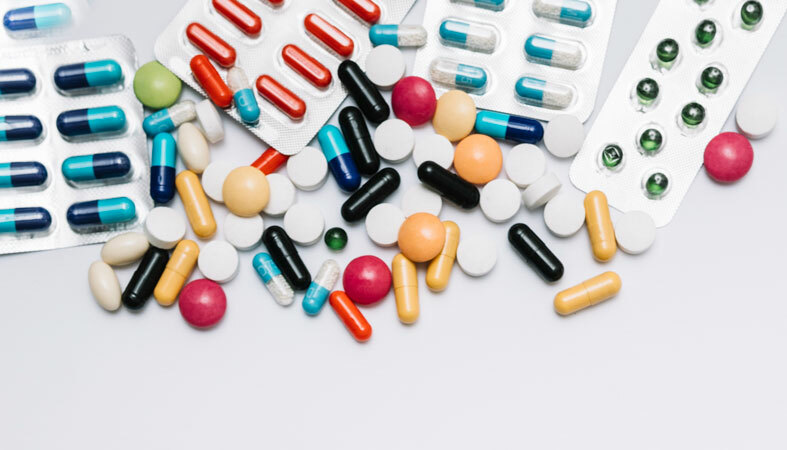 Obviously, a laxative could cause loose stools, but other drugs such as antidepressants, muscle relaxers, antacids, antibiotics, and even anti-vertigo medicines are potential culprits. It could be food poisoning or a reaction to specific foods that encourage rapid and uncontrollable stools. Remember when Frito-Lay introduced WOW chips? They were a fat-free potato chip that used an oil called olestra. This oil’s molecules tasted like fat, but they were too large to be digested, so dieters could indulge in fatty snacks without the consequences. Well, there was one consequence: diarrhea. Because it wasn’t being absorbed, it passed straight through the digestive tract in an oily mess. As if that wasn’t bad enough, cramping often comes along with food-induced loose stools, especially in the case of olestra. An intolerance or allergy to a particular food or substance could also trigger an episode. The culprit is often an enzyme that’s lacking in the digestive system. For example, people who are lactose-intolerant will often have bouts of stomach problems after eating dairy. It’s because they lack an enzyme called lactase that aids in the digestion of lactose, a protein found in milk. A lot of our ailments can be traced back to stress, and nighttime diarrhea is one of them. Stress, in general, puts a tremendous amount of pressure on the organs, including the stomach. When this happens, it reduces the ability to digest and process and food. The result could be loose stools and other digestive issues. No one likes to hear that a painful condition could be all in their head, but it’s something consider. Often, cases of IBS (irritable bowel syndrome) are linked to anxiety, stress or mental trauma. There’s also the idea of a vicious cycle causing diarrhea. For example, if you battled a case of it at an inopportune time (maybe after a romantic dinner date or at a crowded party or event), it may have made you nervous about having a repeat incident. The worry and stress of going through the same thing over again, could in fact trigger your body to repeat the process. Referred to as IBD for short, Inflammatory Bowel Disease is characterized by inflammation in the gastrointestinal tract. Two of the primary causes are Crohn’s Disease and ulcerative colitis, which are both autoimmune conditions. 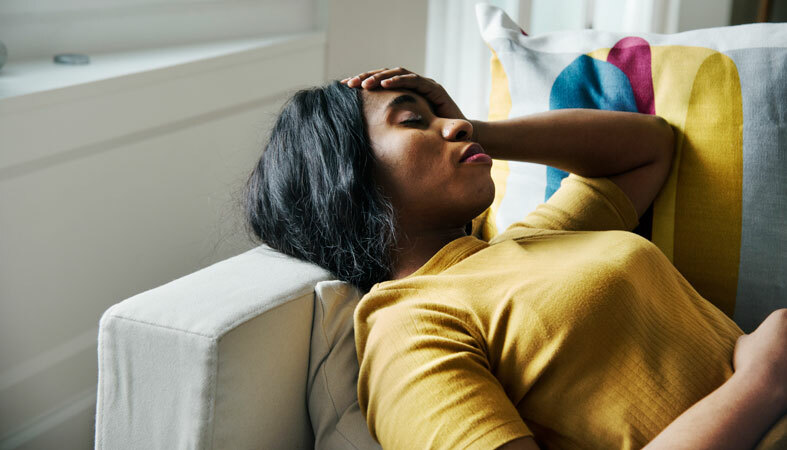 One of the symptoms of an autoimmune condition is inflammation throughout the body, so it’s no surprise that when the pathway in the digestive tract is inflamed it can lead to complications. To combat IBD, a drastic diet overhaul may be in order as diet and lifestyle are often directly related to these types of conditions. 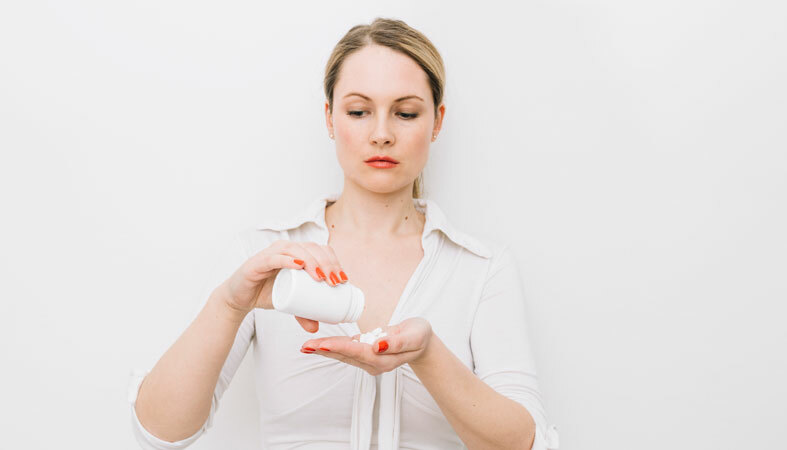 Taking nonsteroidal anti-inflammatory medications like aspirin or Advil also contribute to this condition, somewhat ironically, we might add. An inflamed colon is referred to as colitis, and when the incidence of affected tissue can only be observed under a microscope, it’s then labeled microscopic colitis. No matter the type, both diarrhea and cramping are common symptoms. It may clear up on its own, or you might need to help speed up the healing with lifestyle changes like avoiding caffeine, cleaning up your diet, and staying away from trigger foods like gluten and dairy. Off-kilter insulin levels and the inability of the body to control glucose levels are primary characteristics of diabetes. When this happens to the body, one of the possible side effects is nocturnal diarrhea. This type occurs when the intestine doesn’t properly absorb liquid and electrolytes. The result is they pass rapidly through the digestive tract and come out as watery and loose stools. IBS or irritable bowel syndrome is similar to IBD but without the inflammation. It’s an issue that’s located in the large intestine, and causes bloating, abdominal cramps, and unpleasant bowel movements that are frequent and potentially uncontrollable. Unlike many conditions that increase in frequency with age, IBS most often affects women under 45. While the exact cause is unknown, there is substantial evidence linking many cases to young adults and teenagers who took prescription acne medication. Fortunately, the symptoms of IBS are often well-managed by making dietary changes, taking probiotics and managing stress. One of the fastest and most effective short-term and immediate solutions is to take an over-the-counter anti-diarrheal medication. There are a variety of well-known brand names like Imodium, Kaopectate, and Pepto-Bismol. As you can imagine, loose and watery stools can lead to dehydration. Drink plenty of water, add in some electrolytes and drink either green juices or diluted fruit juices to ensure you have enough liquid in your body. Children and the elderly are the most susceptible to dehydration, so if you have a young person or senior citizen under your care, pay close attention to their intake of fluids. Grease and fiber both encourage accelerated bowel activity. Opt for bland, non-spicy food that won’t irritate the gut. Boiled potatoes, rice, pretzels, saltine crackers and baked chicken without skin are all helpful in settling the stomach. It’s no surprise that caffeine stimulates the mind, but did you know that it also stimulates the digestive tract? We recommend eliminating caffeine during bouts of diarrhea and switch to something soothing like chamomile tea. Alcohol puts undue stress on your system, especially the kidneys and liver, which are responsible for filtering out toxins. The more stress you feel about the situation, the worse it’s going to get. If you’re worried or experiencing anxiety, try to settle your mind by doing a short meditation. Visualize something happy to take your mind off of things. Diet is often the cause for a variety of ailments, including nighttime diarrhea. If you are experiencing this condition semi-regularly, a dietary change may be in order. Perhaps keep a food journal so when you do have something like this happen, you can trace it back to what you ate. Then you know which foods or medications to avoid in the future. There’s good bacteria and bad bacteria. The harmful bacteria can cause bowel issues, while the beneficial gut bacteria not only fight off enemy bacteria, it also keeps our immune system in tip-top shape. A lot of things can harm the flora in the digestive system, including medications, alcohol, and antibiotics. Therefore, you may want to supplement with a high-quality probiotic if you are on antibiotics or have just finished taking them. If you’re worried about random acts of diarrhea, consider supplementing daily. If you have food sensitivities or intolerances, avoid gluten and dairy. Limit caffeine consumption to normal levels. Take a daily probiotic to encourage a habitat of healthy gut bacteria. Manage stress so it doesn’t make your stomach clench at night. Check your prescription medications for side effects like diarrhea and talk to your doctor about switching or stopping the medicine. Anyone can experience dehydration, but babies, toddlers and the elderly are most at risk. Whoever is suffering from nocturnal diarrhea needs to take in extra fluids, including water, electrolytes, broth, and juices. A fever that won’t go down or disappear could be a sign of a more severe infection. If your diarrhea is incessant and it’s accompanied by a fever, consult with a physician. This complication often occurs in patients with IBD. If you have not yet been diagnosed but you’re witnessing either blood or mucus in your stool, an exam by your doctor may be in order. Most episodes of nighttime diarrhea thankfully only last one or two nights. However, if your case continues, you may be battling a parasite, virus or bacterial infection. A doctor or lab could examine your stool to confirm or rule out one of these possibilities. Our insides are a bit of a mystery. Our bodies are trying to tell us something is wrong when we have things like fevers, vomiting, diarrhea, etc., but we don’t always know what the underlying message is. While often, loose stools can be linked to something immediate and temporary in our environment, there are situations when the cause is more serious. Autoimmune conditions, diabetes, and even cancer are all linked to chronic nocturnal diarrhea. This isn’t meant to scare you! But we want you to be aware of all of the possibilities, so you can alert your doctor if there is a concern. Can diarrhea at night be linked to cancer? Sometimes, yes. Some cancer treatments like chemotherapy, radiation, and surgery can all affect your bowel activities. And, sadly, there are types of cancer that cause diarrhea, too. 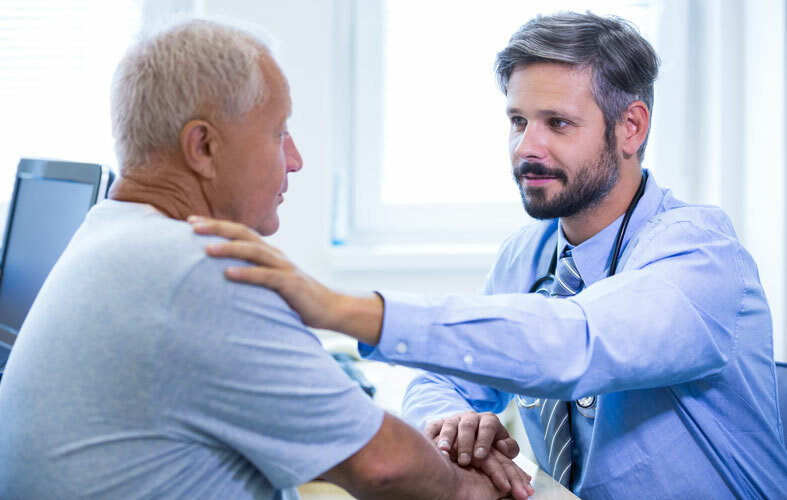 Tumors that affect the balance of hormones, colon cancer, pancreatic cancer, and lymphoma are just a few of the cancers linked to this condition. Can it happen to adults? Yes, it can happen to anyone! As you have seen in this article, there are a variety of causes, and they can affect both children, adults, and the elderly. Can nocturnal bowel movements be caused by food poisoning? Yes, food poisoning is a common culprit. The toxins from the “bad” food trigger a biological response that could lead to cramping, vomiting, diarrhea, or a combination of these three symptoms. In an effort to flush the toxins, the body releases large amounts of water into the intestines. The result is a watery stool that persists while your system gets rid of all traces of toxic bacteria. No one ever hopes to get nocturnal diarrhea, and there’s never a convenient time to experience it. Whether it’s stress, diet, medication or an underlying condition, the good news is that once you find the cause, you can take proactive measures to prevent anything embarrassing or disruptive to occur in the future. 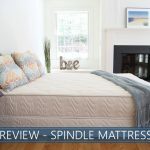 Our In-Depth Spindle Bed Review for 2019: Any Valid Complaints?